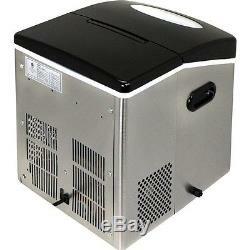 NewAir Stainless Steel 50 Lb. 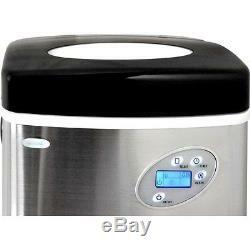 Large Countertop Portable Ice Maker. 13 Min - 12 Pieces. 14.25"W x 16.9"D x 16.75H - 37.6 lbs. 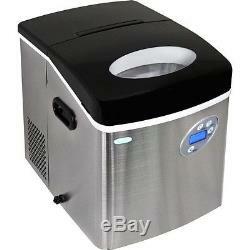 Enjoy fresh ice on the go with the NewAir AI-215SS Stainless Steel 50 Lb. 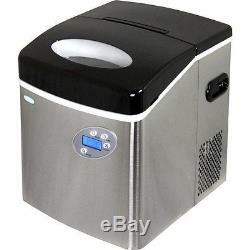 Large Countertop Portable Ice Makerl Great for parties and BBQ's, this ice maker is perfect! Set this ice maker up in the rec. Room or in your backyard. 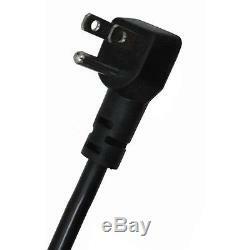 All you need is an electrical outlet. 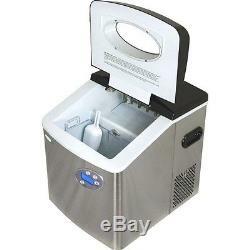 One of our largest capacity countertop ice makers produces up to 50 pounds of ice per day with a removable ice bin that will hold 2.5 pounds of ice for whenever you need to cool down your drink or make yourself a smoothie. Compact & Portable: Perfect To Set Up On Counters Or Tabletops. Get More Ice: By Producing An Amazing 50 Lbs. Of Ice Per Day & Bin Storage Of 2.5 Lbs. Large Reservoir: Holds 1 Gallon Of Water So You'll Spend Less Time Refilling. Stylish Design: Comes In Stainless Steel Sure To Complement Any Room In Your Home. 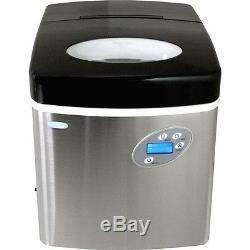 Fast Ice: Produces Fresh Ice Every 7 To 13 Minutes & Up To 50 Lbs. 3 Size Options: Whether You Prefer Small, Medium, Or Large Cubes! 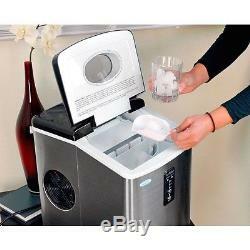 Safety Feature: Automatically Turns Off When Water Is Empty Or Ice Bin Is Full. Indicator Light: Also Indicates When Water Needs Refilling. Easy Clean-Up: With A Side-Mounted Drain To Easily Empty Excess Or Stale Water. 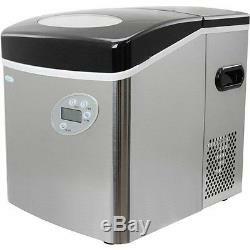 The item "Large 50 Lb Stainless Steel Portable Ice Maker, Compact Countertop Cube IceMaker" is in sale since Friday, August 23, 2013.